Vantum is a chain based on the Ethash proof-of work algorithm, it takes all of what Ethereum is and optimizes it for practical mainstream adoption and use. Unlike many protocols which act in direct competition to fiat-based systems, Vantum acts in partnership with it, looking to offer additional value to already established corporate reward and loyalty systems. to build applications that bridge the gap between mainstream fiat transactions and the faster, more secure, cryptocurrency. Vantum will feature a tiered-masternode system that hosts three distinct masternode roles. Content nodes for publicly accessible file storage (media files and data) for dApps built on the chain. Storage nodes act as backup file servers for digital downloads. Premium nodes do all of the above and receive block rewards. 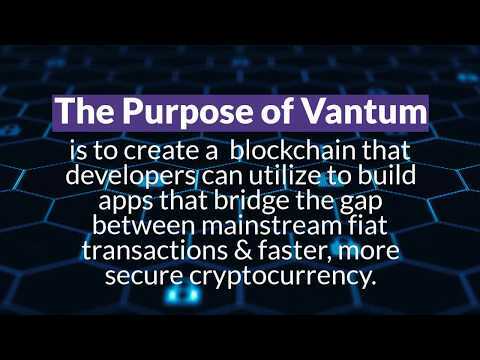 The Vantum Network will be initially targeted to the corporate rewards and loyalty market but has potential applications in any sector that can benefit from truly secure, feature rich decentralized applications.